Just finished reading Uranium: War, Energy, and the Rock that Shaped the World by Tom Zoellner (Viking,2009). The book illuminates various places across the Earth touched by national quests to harness the power of uranium. The second heaviest of the naturally occurring elements, uranium influenced governments behavior though last three-quarters of the 20th century. The book covers the element's discovery in Germany in 1789 leading to uncovering its radioactivity by Henri Becquerel in 1896 and all the way to nuclear proliferation issues of today. 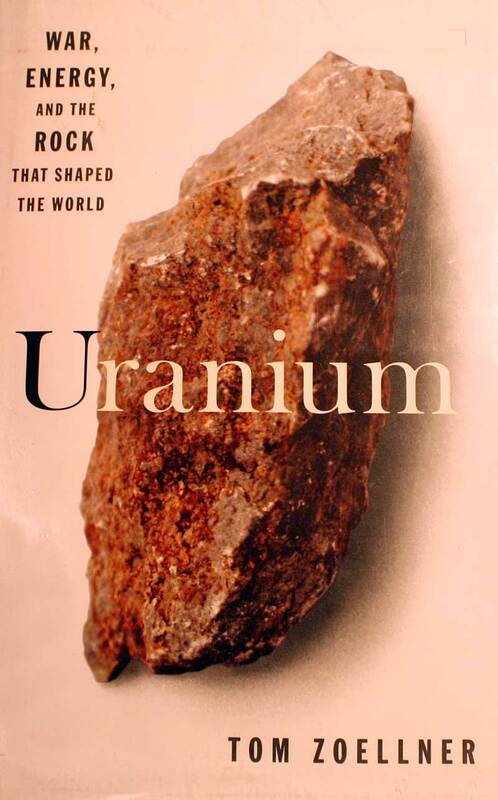 The author covers a broad range of facets of uranium and its applications. Coverage tends to be light on science and statistics though. A lot of stories relate to people involved in the creation of the first American atomic bombs and the competition between the United States and the Soviet Union to collect uranium and produce nuclear weapons. Portions of the book reveal aspects of the jobs involved, technologies, huge costs in human health/money and the environmental cleanups in mining and processing. It also covers nuclear weapon development in Israel, Iran, and Pakistan. The dilemmas Australia faced with uranium mining both culturally and environmentally as they possess 40% of the world's reserves. My interest involved researching type mining localities from the 1800s for a possible future museum exhibit. The stories I found the most interesting was the history of uranium/radium discovery and early mining at St. Joachimsthal (Czechoslovakia). The exploration and mining conditions in Shinkolobwe (Congo), Utah (USA), St. Joachimsthal (Czech Republic), and Wismut mines (Germany) was educational. One point in the book that has me somewhat confused is uranium's type location. The book highlights that Martin Klaproth, a Berlin pharmacist/chemist, discovered uranium in 1789 from material from St. Joachimsthal. Though Wikipedia lists a mine called Georg Wagsforth in Johanngeorgenstadt provided the material. I have also read Klaproth used materials from both localities to make his discovery. Tales of uranium prospector Charlie Steen in his rags to riches to dementia were fascinating. One of the best stories was that of him accepting the outstanding-alumnus award from the Texas College of Mines in El Paso. The school had been renamed to Texas Western College as it expanding the circulum to vocational training and liberal arts. During his "acceptance" speech he railed against classes like Coaching Basketball, Real Estate Brokerage and Baton Twirling. He went further to state he would not accept the award unless it listed the school by its old name reflecting its mining history. So how does this book relates to paleontology? On page 148, while talking about the 1950s Uranium Rush (akin to American Gold Rushes of 1800s), there is mention of uranium soaked fossil trees being found. Prospectors look for ancient stream beds that could contain fossilized trees. "These could usually be found in the Shinarump layer of sandstone, which was like a wedge of crunchy pink mortar between the Chinle and the Moenkopi formations." The book was sold with two different covers. The one shown above is a picture of the one I read. Just a thought, what if the cover pictured uranium bearing green torbernite instead or an eye-catching fluorescent autunite. Maybe the designer wanted to show how plain such a powerful element can appear in its natural form. The other cover, which can be seen on Amazon.com, is probably more relevant to the content of the book dealing with nuclear weapons and the people involved in uranium mining/acquisition. All and all the book is a good read and one can learn all kinds of interesting stories about this element. The author seemed more interested in the weapon aspects of uranium than exploring expanded power uses. The end notes for the books can be found here. Learn more at Tom Zoellner's web site.